The Roland Handsonic HPD-20 expands on the considerable power of the previous hand percussion pads in the range. For the uninitiated, these devices combine Roland’s impressive digital sound technology, with a unique, expressive pad arrangement, specifically designed for playing with hands. This, the latest and greatest incarnation of the Handsonic, is more feature-packed than ever before. At its heart is Roland’s flagship SuperNATURAL sound technology. This employs some very clever trickery to recreate percussion sounds with all of the subtle nuance and expressive timbre changes of the acoustic instruments. In total, the HPD-20 features 850 drum and percussion sounds, with 200 editable preset kits. These are played via a circular, segmented arrangement of 13, velocity sensitive pads. Roland has taken great care to ensure this playing surface is soft and responsive, with each trigger area clearly defined. Perhaps the biggest departure from previous Handsonic models is the HPD-20’s ability to load WAV format user samples. Up to 500 sounds of your choice can be loaded to the pad via USB flash drive, and assigned to trigger zones. In total, up to 12-minutes of sample time is available, meaning that anything from a single drum hit, to a longer phrase, to a whole track can be loaded, ready to triggered with a deft hit. These can be edited in exactly the same way as onboard, preset sounds, infinitely expanding its sonic potential. 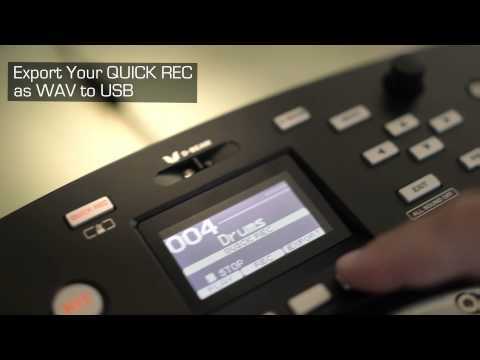 The editing onboard the HPD-20 provides tools for detailed, in-depth editing. Volume, pitch, decay and many other parameters can be edited, plus two sounds can be layered, blended and set to switch between according to velocity. A comprehensive effects engine adds yet another set of powerful, sound-shaping tools. Three, independent FX engines are featured, each with 25 effects types to choose from- from classic effects, such as reverbs and modulations, to cutting edge types, such as bit-crushers and more. A real-time controller knob means that effects parameters can be tweaked and changed on the fly. Though, primarily, it’s designed as a standalone instrument to be played, the Roland HPD-20 can be expanded with the addition of a V-Drum triggers and hi-hat pedal trigger. To ensure that you always capture that moment of inspiration, there’s also a Quick-Rec mode. Performances can be saved to USB, too. In addition to a USB memory slot, there’s also a USB MIDI connection, making it very straightforward to connect to a host Mac or PC and use as a very expressive percussion controller. Standard MIDI input and output ensures that it can easily be connected to other studio equipment, sound modules and synthesizers. The Roland Handsonic HPD-20 Digital Hand Percussion Pad is unlike anything else available. It has superb expressive sounds to please traditional percussionists, but with sample import, and powerful editing tools and FX to satisfy more experimental sonic adventurers- all packaged in an intuitively designed, expandable, and just plain playable all-in-one percussion instrument.